First I diced a small butternut pumpkin and roasted it in the oven – I did this ahead of time so I could rest while it was cooking. In a large pan I cooked 300g of defrosted uncooked prawns then removed them so they didn’t overcook. Thin I browned a diced onion and clove of garlic and then added a sliced zucchini. I added a cup of Arborio rice to the pan, tossed it around then added a glass of white wine and a teaspoon of vegetable stock powder. As the wine was absorbed I slowly added boiling water, stirring the whole time (this is where I wish I had a bar stool to sit on). Towards the end I returned the prawns, added the pumpkin and 250g of fresh shelled peas. 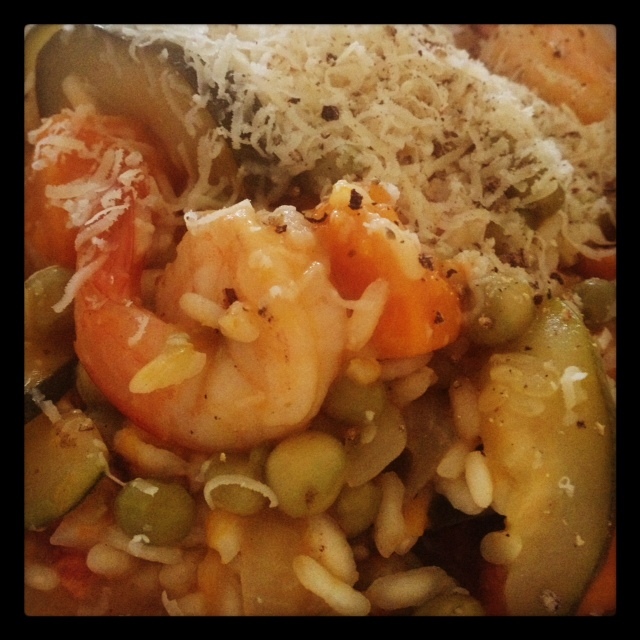 Once the rice was cooked I added about a ½ cup of grated parmesan and some cracked pepper. Enough for about 4 serves (I froze 2 serves to help restock my freezer).